Enjoy a relaxed life at Kolte Patil Centria! Kolte Patil Developers Ltd. is one of the pioneers in the real estate companies in Pune. Established almost 2 decades ago they believe in the philosophy ‘Creation, not construction’. 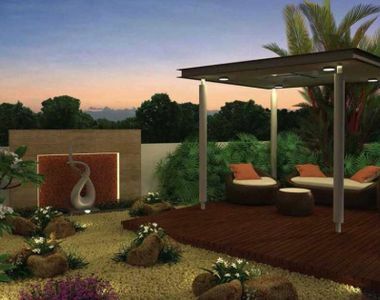 Kolte Patil Developers are the largest developers in Pune and has completed almost 1.5 crore sq. ft. of development. Living true to their values, Kolte Patil has a 3BHK scheme in Pune under the name of Kolte Patil Centria. Wake up to the breezy, bright and blissful mornings in the 3BHK spacious apartments at Kolte Patil Centria Pune. Each and every apartment here offers a private terrace of 100 sq. ft. scientifically designed east-west facing layout, utmost privacy is guaranteed here. 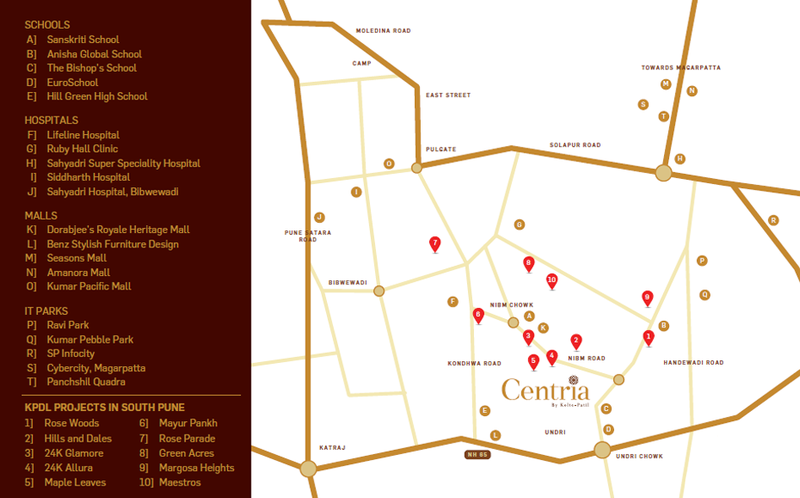 Strategically located in the heart of the city and in the neighbourhood of the upmarket Undri, at Centria you’ll get everything that you need to live your life to the fullest in the near vicinity. Top restaurants, multispecialty hospitals, top class salons, malls, international schools, and colleges all are located in the close proximity. With more than 10 schools within the range of 2.5 km, your children will easily grow with best of education. Hospitals such as Inamdar Hospital, Ruby Hall Clinic, Lifeline Hospital, etc. are all very close by. The Dorabjee’s Heritage Mall is just 2 km from Centria. Located at NIBM, Kolte Patil Centria has 3 towers of 13 floors each and 2 levels of parking. The project has a total of 120-150 3BHK apartments. The scheme offers more than 20 special amenities such as Club House with indoor badminton and squash court, , barbeque pavilion, gymnasium, dry garden, mini amphitheatre with meditation pavilion, therapeutic herbs and spice garden, landscaped garden with children play area, connecting walkway, swimming pool with temperature controlled kids’ pool, chess board, and many more. The security of the inmates is taken care of at Centria with a 24X7 security guard and CCTV cameras. Intercom facility is available for additional security. The spacious 3BHK homes in NIBM area come with a private terrace. The homes are floored with vitrified tiles, while the ceramic antiskid tiles are offered in the bathrooms and galleries. The false ceiling is provided in the halls and the living area. The kitchen platform is fitted with granite and dado of 2 feet. There is a provision for hot and cold water with the stainless steel kitchen sink. Provision for Inlet and outlet of water is provided in the dry balcony. The private terrace is so spacious that you can easily organise a family get together of 50 people in your home itself. The best part is that with all these features and space of 97-106 sq. ft., the Kolte Patil Centria Price ranges from Rs 89.48 lakhs to Rs 98.97 lakhs. So what are you waiting for? Come and book your home with one of the most prestigious groups in Pune. Therapeutic herb and spice garden.